TUGboat, Volume 32 (2011), No. 2. 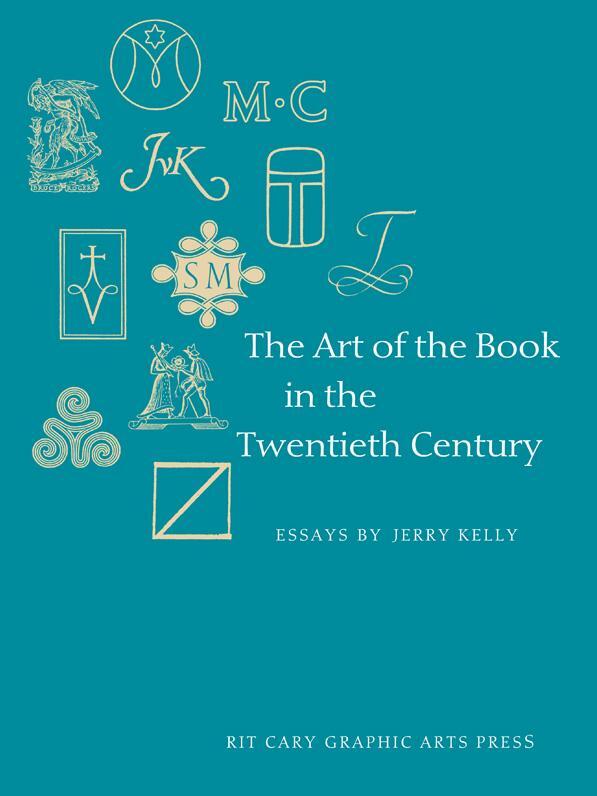 Jerry Kelly, The Art of the Book in the Twentieth Century. RIT Cary Graphic Arts Press, Rochester. 2011. 200 pp. Hardcover, US$39.95. ISBN 78-1-933360-46-1. This book does not mention TeX on any of its two hundred pages. However, I think publication of the review in the pages of TUGboat is justified. The famous exhortation [2, p. 303] “Go forth now and create masterpieces of the publishing art” is as much a part of The TeXbook as the explanation of \noexpand or \futurelet. Thus discussions about the art of the book are relevant for TUG publications, and we will continue reviewing books about publishing, typography and typesetting. This collection of essays by Jerry Kelly is a good example of them. Of course, the fact that the last chapter in the book is written about the Wizard of Fonts, permanent honorary board member of TUG, Hermann Zapf, only adds to the allure of this book for TeX users. The last century saw many quick changes in the technology of book making. At its beginning, most typographers used letterpress. Hot metal machines, phototypesetting, offset printing and other inventions came and went, to be supplanted today by digital typography. Book making was deeply influenced by these changes. The tumultuous history of society and art in 20th century was another source of influence for the old art of typography. Thus writing about book making in this period is a very difficult—but a very interesting—task. Jerry Kelly approaches his subject with a biographical method. His book is a collection of short essays about the leading typographers of the last century: Daniel Updike, Bruce Rogers, Joseph Blumenthal, Stanley Morison, Francis Meynell, Giovanni Mardersteig, Jan van Krimpen, Jan Tschichold, Max Caflisch, Gotthard de Beauclair and Hermann Zapf. Each essay has a length (and is written in a style) comparable to an entry in a typography encyclopedia and is accompanied by a selection of reproductions of the typographer’s masterpieces. Of course, the chosen format does not allow the author to do a deep analysis of the life and art of his subjects, but the book features a good bibliography section where a reader can find materials for further reading. Even these short bios, however, can lead to interesting thoughts about the way the works of the masters reflected their lives and the society around them. For example, Kelly says that the Great Depression disrupted the fine printing business model, and the typographers tried to cope with this. This is an interesting story—for example, how much was the success of the famous Nonesuch Press caused by their large inventory of titles and the novel ways to lower the cost?—which probably deserves a separate book. Further, Kelly mentions the arrest and imprisonment of Tschichold by the Nazis and posits that this arrest might be one of the causes of the famous “conversion” of Tschichold to the more classic typography. Again, it is only a part of the story. Initially these “revolutionary” artists of 1920s sometimes identified with the nascent totalitarian ideologies of Communism and Nazism. Bauhaus and Tschichold’s die neue Typographie in Western Europe corresponded to VKHUTEMAS Art School and the works of Lissitzky and other Constructivists in Russian book design (see  for a discussion). However, when these regimes came to the power, both they and the artists became disappointed in each other. The latter discovered that the former were not especially eager to overthrow the “old art” and preferred the pseudo-classicist imitation of the styles of previous epochs. As seen from these two examples, Jerry Kelly just mentions such topics, and leaves a more detailed discussion for other books. However, the fact that his essays might spark thoughts about the evolution of book arts speaks about the quality of his book. Of course, tastes differ, and some readers may suggest other lists of influential typographers. Kelly himself concedes that “The selection—both of the designers and their works—is somewhat arbitrary.” However, the selection of subjects and the style of the book are the sole prerogative of the author, and Kelly certainly deserves the right to develop his own vision of the history of typography of 20th century. Unfortunately reproductions, no matter how carefully produced, can only partially convey the effect of a finely produced book: we cannot reproduce the paper it was printed on, nor create a facsimile of the particular impression of type on that paper, to say nothing of binding designs and materials, or even elements as basic as the size, heft, and the overall “feel” of a particular volume (all characteristics which are carefully considered in fine printing). Nevertheless his illustrations are a great boon for many of us who cannot visit all the various museums and libraries where the gems of the typographic art are kept—or peruse them at will. The book contains 104 full page plates and 12 smaller illustrations in the Introduction, plus portraits of all the subjects of his essays. One can spend hours just looking at these illustrations. They are carefully chosen and reproduced with great care. While the reader cannot see the gold leaf roundels in Bruce Rogers’ Odyssey (plate 19), or appreciate the full size of Tschichold’s poster (plate 71), still the book manages to give the feeling of these masterpieces. The author approvingly quotes Morison’s dictum “The history of printing is in large measure the history of the title-page.” Accordingly, most of his plates are title pages of the books by great designers, but Kelly also gives nice examples of body pages and spreads. Many TeX users are interested in the design of mathematical books; plate 20 reproducing a page of Euclid’s Elements printed by Random House in 1944 might provide some food for thought. Of course a book about typographic art should in itself be an example of typographic art. This book is tastefully designed and produced. It is typeset in Aldus and carefully bound. It is a pleasure to open and read. My only peeve is the way paragraphs are separated: there is neither indentation nor separating vertical space, and the only indication of the paragraph start is the shorter last line of the preceding paragraph (to achieve this effect in TeX one sets \parskip=0pt and \parindent=0pt). Jan Tschichold with his usual forcefulness called this style “an ill-conceived mannerism” and “dubious practice” [3, p. 106]. To tell the truth, though, even he conceded that it might be acceptable if the compositor takes care to make the last lines of the paragraphs short enough to signal the end to the reader—which is the case for this book. TUG members might also be interested in other books from the same publisher—including several by Hermann Zapf. They can be browsed at http://carypress.rit.edu. Alan Bartram. Bauhaus, Modernism and the Illustrated Book. Yale University Press, New Haven, CT, 2004. Donald Ervin Knuth. The TeXbook, volume A of Computers & Typesetting. Addison-Wesley Publishing Company, Reading, MA, 1994. Illustrations by Duane Bibby. Jan Tschichold. The Form of the Book. Essays on the Morality of Good Design. Hartley & Marks, Point Roberts, WA, 1991. Robert Bringhurst, editor.